My new motto is, "Where would the challenge be if I trained?" 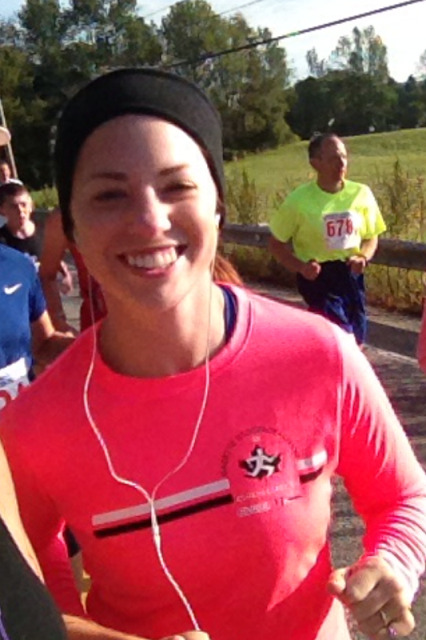 On Saturday, I completed my 3rd half marathon in my 3rd state. 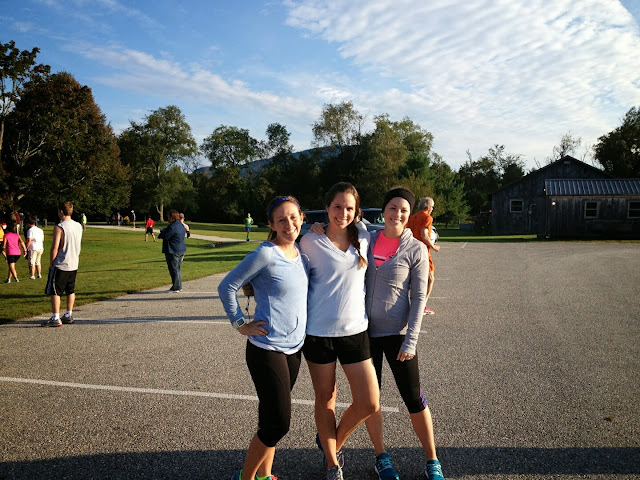 Christine, Jessie, and I drove up to Manchester, Vermont for the Manchester Maple Leaf Half Marathon. Jessie drove out from Boston and I drove out from Rochester and the three of us met up in Troy, where Christine was kind enough to drive us to the race. Let me just say, Jessie and I were having a tough morning and our bodies were not cooperating. If you are a runner, you can probably surmise what this means. It was rather chilly when we arrived at 6:45am. Parking was very easy, which wasn't too surprising, considering this is a race of less than a thousand people. 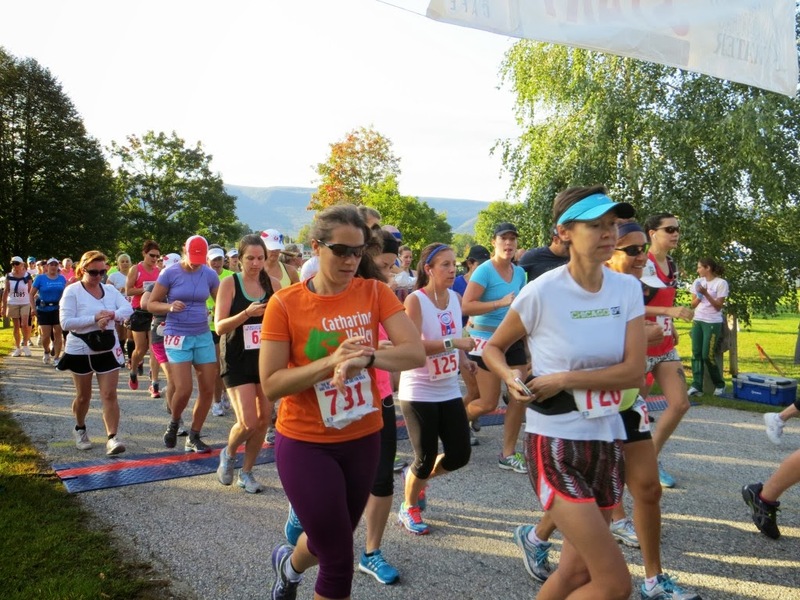 The number of participants has almost doubled since last year, and I expect this race will continue to grow. We parked, got our bibs and then hung out in the car for a good 45 minutes or so, since it was too cold to wait outside. Christine had been training and so she was well prepared for the race. Although neither Jessie nor I had trained, we both ended up doing far better than anticipated. I had to laugh because Jessie had been talking about how horrible she was going to do for weeks, and of course she didn't do horrible at all. In fact, she PRed for the year. If you look closely, you can see me (or at least my shoes) behind the woman in orange. Jessie and Christine are to my left and right respectively. Unsurprisingly, the course was a bit of a challenge. The first 6 miles or so were rolling hills through towns and houses. 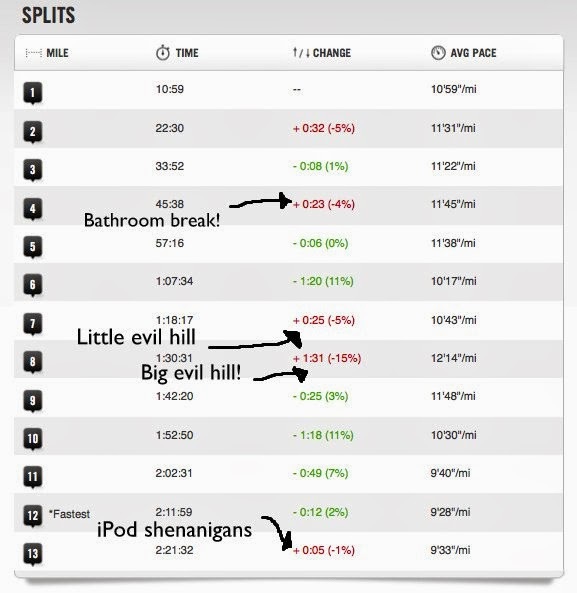 Miles 7 and 8 were doozies, though. First, there was a small but nearly vertical gravel hill, which was followed by a much larger gravel mountain about a mile later. These two areas really zapped my energy and I was wishing I had brought more than 1 Shot Block package. My stomach kept grumbling and I was getting weird cold sweats and cramps. I'm chalking that up to the combination of a lack of sleep and caffeine, although I really have no idea what the deal was. I did reasonable well and even improved my time. I finished in 2:24:20 - and according to my GPS, I actually ran 13.23 miles, which gives me a pace of around 10:54. Something I can be pretty happy with, considering I had to take an off road bathroom break around mile 5, which definitely added a few minutes and some distance on to my overall time and mileage. Half of that added time was trying to get my pants back on. I wore new pants to run in (bad idea!) and they definitely ended up being too small. Let me say, I stretched that spandex to within an inch of it's life. It was so tight, I think my thighs were going numb. DIY Compression Pants? Needless to say, an important lesson was learned - never run in clothing you haven't tested out before! Overall the race was quite nice. The supposed purpose is to see Vermont in all of its glory, but if you're from the northeast, then you know that leaf peeping season doesn't usually happen until October, and this year was no exception. Although everything was still very, very green, the scenery was lovely, especially after mile 8. However, by then I was generally too tired to appreciate it. The food spread after the race was fantastic as well - probably the best food of any race I've been to. Plus, the medals are cute (although, If I am being picky, I would have appreciated a more substantial ribbon). There was a single port-a-potty at mile 6, so many runners were randomly running in and out of the woods. There were numerous water stations about ever 1.5 miles, and a mile marker at every mile. This race does not have shirts included with the purchase price, and since I'm drowning in a surplus of race shirts, I chose not to purchase one, and just went with the included drawstring sports bag. Al the medals were different sizes, 5k runners also got them. Overall, I'm feeling pretty good about how things went. I would love to run a flat course and see how fast I can actually go. I'm still trying to track down a bib for the Wineglass Half Marathon in October. If I do (fingers crossed! ), then I'm certain I'll PR and bring my time down quite a bit.